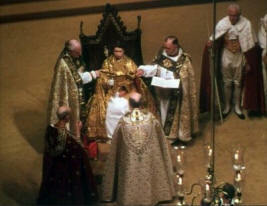 David's Throne - Jesus will return to the Throne of England and be Crowned King of Kings! 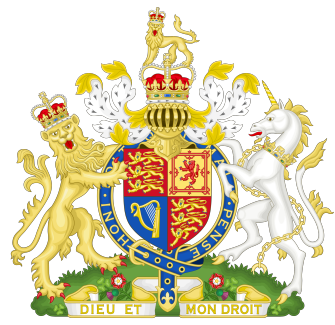 Geological Evidence for the British Throne of David? ©2003 by John P. Pratt. Click here to download your free "Royal House of Britain" ancestry chart tracing back through Jesus Christ to King David. Could the tradition that the British monarchy is the kingly line of David, crowned on the Stone of Jacob, be subjected to scientific scrutiny? Today marks the fiftieth anniversary of the coronation of Queen Elizabeth II of the United Kingdom on June 2, 1953. Surely her half-century reign would be the envy of many ancient kings, who considered one measure of their greatness to be the length of their reign. Great Britain has been a world power for centuries, and heads the Commonwealth of Nations which spans the globe with nearly fifty member countries. How could a few small islands have come to have such widespread influence? Just who are the British anyway? during her Coronation in 1953. When one traces the roots of the Britons, Scots, Irish, Welsh, English (Anglos and Saxons), Picts, Normans, and Celts, there is substantial evidence that all of those peoples are of Israelite descent. The tribe of Joseph seems to be best represented, but there is evidence for the presence of several of the tribes. Volumes have been written on that subject, but in this article, it will be taken as a starting point that the inhabitants of the British Isles have a lot of the blood of Israel. Because of this anniversary date of the monarchy, let us focus on the succession of British royalty. Thy seed will I establish for ever, and build up thy throne to all generations. . . . Thus, the Lord covenanted that, notwithstanding their potential wickedness, the descendants of David would rule as kings over Israel forever. If they became wicked, then they could bring calamity on themselves and their subjects, but their kingly line would continue. That's an amazing prophecy. All it would take to break it that the monarchy be overthrown, or to have no royal descendant who could inherit the throne. So has the royal line continued unbroken? It clearly was continuous for some four centuries until the time of king Zedekiah, last King of Judah in Jerusalem. In 587 B.C., at the fall of Jerusalem to Babylon, King Zedekiah, of the royal line of David, saw his sons slain before his eyes (Jer. 39:6). It was apparently Nebuchadnezzar's attempt to end the succession of Jewish kings, but there was a detail of the Hebrew law with which he was apparently unfamiliar. A princess could also inherit the throne if she married someone from the tribe of Judah (Num. 27:8; 36:3). So what about the daughters of Zedekiah? We are explicitly told that the daughters of Zedekiah were taken to Egypt along with the prophet Jeremiah and others (Jer. 43:6). There Jeremiah prophesied that all those who fled to Egypt would also be killed, except a few who should escape (Jer. 44:1-14). That is where the Biblical story of Jeremiah ends, except for the hint that Jeremiah's mission was not only to tear down, but also to plant (Jer. 1:10). No planting is described in his mission in Jerusalem. Where did Jeremiah do his planting? And where was the new kingdom described in the parable given to Ezekiel, where a "tender twig," cut from the highest branch of the high cedar, would be planted and grow into a great kingdom, and that the lower tree would be exalted above the upper? (Ezek. 17:22-24) That tender twig may well have been the daughter of Zedekiah. For the "rest of the story" we must turn to the history of ancient Ireland. The following account is summarized from authenticated histories rather than mere legends or speculation. The earliest known colonizers of Ireland were the Danai, who almost certainly were from the tribe of Dan. They had separated from the other tribes shortly after the Exodus, and founded some cities in Greece, including Athens. About 1200 B.C. a colony of Danai from Greece journeyed to Ireland. Centuries later a group of Israelites called the Milesians arrived and subjugated the Danai. The Milesians were either the same as, or joined with, the Scots, who had migrated to Ireland from Scythia (Scotia = Scythia), near the Black Sea. The Flag of Northern Ireland combines the Star of David (Pharez) with the Red Hand (Zerah). The kings of both of these nations came from Judah, from the line of Zerah. Who was Zerah? Judah was given the promise that his children would reign until Shiloh comes (Gen. 49:10, most likely referring to the second coming of Christ). His descendants all come through his twin sons Pharez and Zerah. David came through the line of Pharez, and a similar promise was made to him concerning his descendants, as noted above. But the line of Zerah also produced many kingly lines, including the kings of ancient Ireland. For the purposes of this article, we need only understand that the ancient Irish were of Israel, and their kings were from Zerah, whose symbol was a red hand, or a hand with red thread tied around it (Gen. 38:28). The histories say that in about 584 B.C. a Milesian chieftain named Gathelus became a hero in Egypt and married the Pharaoh's daughter, Scota. Gathelus must have given her that name in honor of Scotia, or Scythia, the former country of the Scots. The histories explicitly state that Gathelus was a descendant of Cecrops who founded Athens. My conclusion after doing this research is that the Milesians were not the same as the Scots. The Milesians were most likely a second colony from Greece which came about 1000 B.C., and the Scots probably migrated from the Black Sea after the Assyrian captivity in Israel about 700 B.C. Thus, Gathelus giving his wife the name Scota might have been a way to help politically merge the two groups into one. They moved to the part of Spain now called Portugal and built the city of Brigance and called his subjects Scots. Gathelus and Scota had a son named Eochaidh whose wife Teah Tephi chose Ireland to be their residence. They founded Tara in Ireland, officially called their subjects "Scots" in honor of his mother, and Ireland later became known as Scotia. The histories also mention that Eochaidh was accompanied by a prophet named Ollam Fodhla and his scribe Berach. Gathelus (or perhaps Ollam Fodhla) prophesied that wherever his marble seat would be found, there would reign one of his descendants over the Scots. The Harp is the Symbol of Ireland on the Royal Flag. What has all of this got to do with our story? Some versions identify Scota as the daughter of King Zedekiah, Ollam Fodhla as Jeremiah, and Berach as his scribe Baruch. But wasn't Scota the daughter of Pharaoh? Remember that "pharaoh" is simply the Egyptian word for king, and Zedekiah's daughter certainly was a king's daughter who was in Egypt. The traditions also state that the small group who thus escaped from Egypt took with them to Ireland the harp of David, the ark of the covenant, and the stone of Jacob. It states that King Eochaidh was coronated by Jeremiah in Ireland while sitting on the stone of Jacob, and some versions add that his wife Teah was the sister of Scota and also a daughter of Zedekiah. The harp of David became a national emblem of Tara and of Ireland. All the kings of the Scots in Tara were coronated on that stone for over a thousand years. Then about A.D. 500, Fergus of Ireland conquered the Picts who lived in Scotland. The Picts agreed to accept him as king, so he had the Stone of Destiny moved to Scotland, where he was crowned on it. It thereafter also became known as the Stone of Scone (pronounced "Scoon") because it resided at the castle there. True to the prophecy, that land where the stone resided was ruled by a Scottish king, and became known as Scotland. Later, King James VI of Scotland became James I of England, and today Queen Elizabeth is his descendant. Thus, even now that Scotland forms part of Great Britain, it is still true that the Scots are ruled by a monarch of Scottish royal descent. 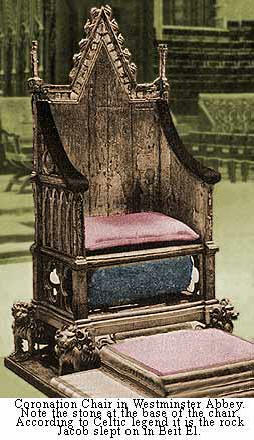 The Coronation Chair was built around the Stone of Scone (just below the seat). The Stone of Destiny was moved to Westminster Abbey in London, England, in 1296 A.D. by King Edward I. 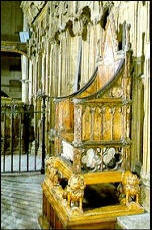 He had a special "coronation chair" built around that stone, and all of the British kings and queens have been crowned in that chair since, including the currently reigning Queen Elizabeth II. 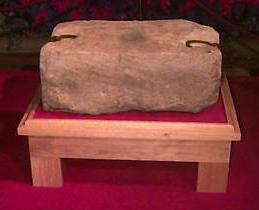 In 1996 the stone was returned to Scotland. 2.3 Were Davidic Kings Coronated on the Stone? The Coronation ceremony appears to have been taken as directly as possible from the description in the Bible of the coronation of David and Solomon. The monarch is anointed with sacred oil by the Archbishop of Canterbury, trumpets sound, and the people shout "God Save the King" (1 Samuel 10:24, 1 Kings 1:39). The royal crown contains twelve jewels made of the same twelve stones which were in the breastplate of the high priest (Ex. 28:17-21). These similarities alone do not prove that the kings really are the royal blood of Israel, but such would be expected if the British throne is the continuation of the throne of David. Of course, the royalty also have extensive genealogies to prove their lineage. Here were are told that along with the usual parts of the coronation ceremony, that also the king stood at his pillar, as was the custom at coronation. What does that mean? Some Bible translations are more literal and render it, "The king stood on the pillar." How can one stand on a pillar? It turns out the word translated pillar come from the root meaning "to stand" and can also refer to a "stand" or "platform." The meaning of pillar come from the idea that a pillar is standing up on its end. So the verses could also be saying that the king was coronated while standing on his stand, as was the custom. Was that stand or pillar the Stone of Destiny? If so, just what is it that makes this stone so special? It was called the Stone of Jacob. Just what was the stone of Jacob? The is a strange story in the Book of Genesis, which has been somewhat enigmatic. In the light of knowing about the traditions surrounding the Stone of Destiny, and knowing its size and shape, and knowing that authentic or not, an unbroken chain of kings has been crowned on that stone for centuries, the following history now makes a lot more sense. And he called the name of that place Bethel: but the name of that city was called Luz at the first. (Genesis 28:11-19). This account includes several puzzling features. First, a stone small enough to use as a pillow seems hard to imagine being set up as a pillar. Second, just because he had a dream about how the multitudes of his posterity would spread out all over the world, why would he anoint his pillow stone with oil? And what did he mean that the stone would be for God's house? It was important enough that he renamed the place Bethel, which means "House of God." Did it have something to do with a temple? The size and shape of Stone of Destiny helps make sense of this account, in case it really is this stone of Jacob. First, it is in fact about the size and shape of a big pillow, being about 26 x 16 x 10 inches. It was apparently already a stone which had been cut into a rectangular building shape when Jacob found it. It was probably rejected by the builders because it has a crack in it, so it had been discarded before being finished. If the Stone of Destiny really is Jacob's stone, then it is easy to see how he could stand it up on its end to be a "pillar." Actually, it might have been difficult because it weighs over 300 pounds. Checking the meaning of the word translated "pillar," we see that it means a "stone marker," which often were very large pillars. Most likely this one served mostly as a marker, so that he could find the location when he returned. Two decades and a dozen children later, Jacob was commanded to return to Bethel. After Jacob returned, and had built and anointed a more permanent altar, God appeared to him there and announced that his name would be changed to Israel, adding "a company of nations shall be of thee, and kings shall come out of thy loins" (Gen. 35:11). This is most likely the time when Jacob decided to bring the original stone with him, though we are not explicitly told that detail. Note that the announcement that kings would descend from him occurred there. It would not be surprising if he was also given to know the future relation that his stone might have to those kings. The Stone of Destiny has two rings which have clearly been used for transporting the stone by sliding a pole through both rings. There is a groove worn between the two rings which testifies of having been gradually eroded by such transport for an extended period. The stone would have been taken not only to Egypt with Israel, but then also with them at the Exodus and the forty years in the wilderness. Presumably it stayed in Jerusalem from the time of David until the fall of that city in 587 B.C. There is evidence in the Bible the it might well have been this stone which was specifically indicated to have been the "stone of Israel" which symbolized Jesus Christ. During the blessing of Jacob to Joseph, he inserted parenthetically, "from thence is the shepherd, the stone of Israel" (Gen. 49:24, compare D&C 50:44). Thus, the Rock of Salvation (Psalms 95:1) which shepherded the Israelites, apparently referred to the physical Stone of Jacob. Of course, as Paul explained, it was symbolic of Jesus Christ, who also identified himself as the Good Shepherd of Israel (John 10:11). If the identification with the Stone of Scone is correct, then it is a very plain looking piece of calcareous sandstone, so ordinary that in preparing this article I noticed that several web pages describing the Stone of Scone were scoffing at how plain it is for the royalty to make such a fuss about. Thus, it has "no form nor comeliness" and "no beauty" that is should be desired, which is exactly how the Savior is described (Isa. 53:2). That led to it being "despised and rejected of men" (Isa. 53:3). It may not only have been the original builders who discarded the stone. There is a also a tradition that when it came time to build the temple of Solomon, that the stone of Jacob, which was associated with the house of God from the beginning, should be included. But the builders rejected it because of the crack in it. There seemed to be no way that it could be a cornerstone to a temple. Nor did it seem to the Jews who saw the Savior that there was any way that he could be the Messiah, the cornerstone of their religion. Thus, both were despised and rejected. David prophesied that the stone would be rejected (Psa. 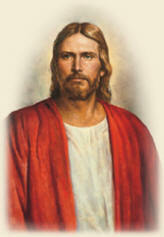 118:22), and Jesus identified himself as fulfilling that prophecy. He explained that the "stone which the builders rejected, the same is become the head of the corner" (Mat. 21:42, compare Acts 4:11). Knowing the Jesus Christ is the Rock of Israel (2 Sam. 23:3), we have long understood that scripture in the spiritual sense. But now that we learn about the Stone of Jacob, we see that the prophecy might well have been fulfilled in the physical sense also. Is the Stone of Scone indeed the Stone of Jacob, which Jeremiah brought to Ireland, and on which British royalty has been coronated for so many centuries? Is there any way to verify these traditions, or will such ancient claims remain forever impossible to verify? In the age of modern scholarship, it has become fashionable to demote all ancient history and tradition to the realm of legend, myth and fantasy. In many cases, that is like throwing out the baby with the bath water because there is usually a core of truth handed down in legend. In preparing this article, browsing the web for the "Stone of Scone" led to more articles ridiculing the traditions than those giving them any credence at all. Modern writers have assumed the Stone of Scone must have originated from a local quarry. I am only aware of two scientific attempts to determine the origin of the stone. The first was by Professor Totten of Yale University. In response to suggestions that it had come from a local quarry, he issued the statement:, "The analysis of the stone shows that there are absolutely no quarries in Scone or Iona wherefrom a block so constituted could possibly have come, nor yet from Tara." The second study was done by Professor Odlum, who was a geologist and professor of theology at Ontario University. He made microscopic examinations of the stone, comparing it to quarries in both Scotland and Ireland, and found it dissimilar to stones from those areas. He became intrigued with the idea of that it might really be the stone of Jacob. That hypothesis could be tested scientifically by searching to see if a similar type of rock is found near Bethel, where Jacob found his stone. After considerable searching he found some strata rather high near a cliff that had exactly the type of composition he was looking for. He chipped off a piece and later performed microscopic tests. He concluded that his sample "matched perfectly" with the coronation stone. Desirous for even better proof he sought to get a little piece the size of a pea from the coronation stone, on which he could perform chemical tests. When he petitioned the Archbishop of Canterbury for such a piece, the reply was that it would take an act of Parliament signed by the King, and even then he wouldn't provide it. To the best of my knowledge that was the end of a really fine scientific experiment which could at least partially validate the claim that the stone might have come from Bethel. This is an excellent example of how science can indeed be used to validate historical traditions. They cannot provide proof, but can greatly add to the credibility of a story. What is needed now is a really thorough scientific study of the stone to verify its authenticity. Preliminary geological studies have indicated that the Stone of Destiny, upon which British monarchs have been crowned for centuries might indeed be the stone of Jacob as tradition asserts, because it matches a formation near Bethel, the Biblical location of the stone the prophet Jacob found. Further scientific testing is now required, such as a thorough chemical composition comparison, and even that can only confirm the possibility that the stone is authentic. In any case, on this fiftieth anniversary of the coronation of Queen Elizabeth II, we can pause to pay respect to what very well might be the continuation of the unbroken line of succession of kings reigning over the children of Israel, from King David, over three thousand years ago. 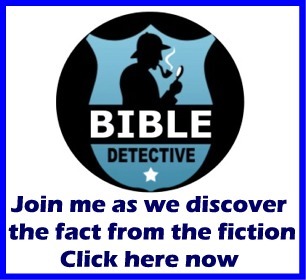 Have you ever heard of "The Lost Tribes of Israel"? Did you know there was 13 tribes of Israel? So how did such a large population of Israelites disappear in history? Where did they go? Where are they now? In this two part sermon by Pastor Joe Cortes of Faith Cometh By Hearing ministries (www.teachingfaith.com ), we learn the tribes of Ephraim and Manasseh are the peoples who founded Great Britain and eventually the United States of America.